​We all remember *that* away game against Huddersfield, and unfortunately for all the wrong reasons. We all remember Tom Ince turning him inside out, David de Gea saving the following attempt, Aaron Mooy following it up and burying the ball into the bottom right-hand corner. We all remember the mistimed header where Laurent Depoitre capitalised on his mistake, rounded De Gea and slotted it home. It was a day to forget for Victor Lindelof. He went on to feature in a total of 20 games for Manchester United in all competitions during the 2017/2018 season and was left out of the squad a total of 13 times during the course of the season. These are, objectively, numbers that are not good enough for a £31m signing playing for Manchester United - especially when looking at his competition at centre half. The criticism, or slating if you will, from newspapers and media outlets towards Lindelof was, well, heavy. Spanish sports newspaper Marca put Lindelof at centre half together with Leonardo Bonucci and Benedikt Höwedes in their 2017 worst XI of the year. FourFourTwo named him as Manchester United's worst player during the 2017/2018 season, where they also included these words in their justification of their choice of Lindelof; ”there is nothing indicating that he will be around for long at Old Trafford”. He needs the fans to back him. Luckily, the World Cup came around at just the right time for the Swede. As has often been the case with Lindelof, he has seemed to, on most occasions, perform a lot better with the Swedish national team than with ​Manchester United. And this was no exception. Missing the first match against South Korea due to illness, he put up top performance after top performance alongside his colleague at centre half Andreas Granqvist, leading Sweden to the round of sixteen where they triumphed Switzerland. It took them to the prospect of facing World Cup final contenders England in the last eight. With the whole world watching, and more importantly the English press and media, he put in a solid performance, keeping ​Harry Kane quiet throughout the 90 minutes. But it was not to be. Sweden had been knocked out and football was, at that moment, coming home. But Lindelof had shown exactly how good he could be when at his very best, helping Sweden to a quarter-final of the World Cup for the first time since 1996, conceding only four times throughout the whole tournament. When the starting lineups were announced ahead of Manchester United vs Leicester on the opening day of this season, Lindelof and Eric Bailly could be found at centre half. A decent performance was put in by the pair and were designated to start in the next fixture away versus Brighton. A game which, once again, was remembered for all the wrong reasons. Lindelof was outsmarted by 34-year-old Glenn Murray as he flicked the opening goal in for Brighton. Shane Duffy scored the second after a series of errors in the Manchester United defence and Pascal Groß scored their third from the penalty spot after a mindless challenge from Bailly. Lindelof was back to square one. The Mirror commented on his performance with the harshest of assessment, asking, ”is he the worst big defensive signing Mourinho has made?” and Gary Neville was not any kinder in his judgement - "Bailly and Lindelof were poor. They are the ones Jose has signed. It has been poor recruitment. That back four aren’t good enough to win the title". In the following fixture against ​Tottenham, both Lindelof and Bailly were left out of the starting eleven, with Lindelof being placed on the bench and Bailly being completely left out of the squad. Two goals from Kane and Lucas Moura later, Phil Jones got injured and was unable to continue. Lindelof was subsequently subbed on, and in the 65th minute, he was completely unchallenged looking for a pass from his position at centre half. Lindelof turned back and executed the weakest of passes back toward De Gea in goal. Dele Alli went round De Gea but hesitated with his finish and De Gea was able to avert the situation. Lindelof can be seen jumping and furiously punching the air, obviously because of his own mistake and nothing else. On the following corner, he failed to mark Kane and he came as close as you can be to scoring his second of the night. 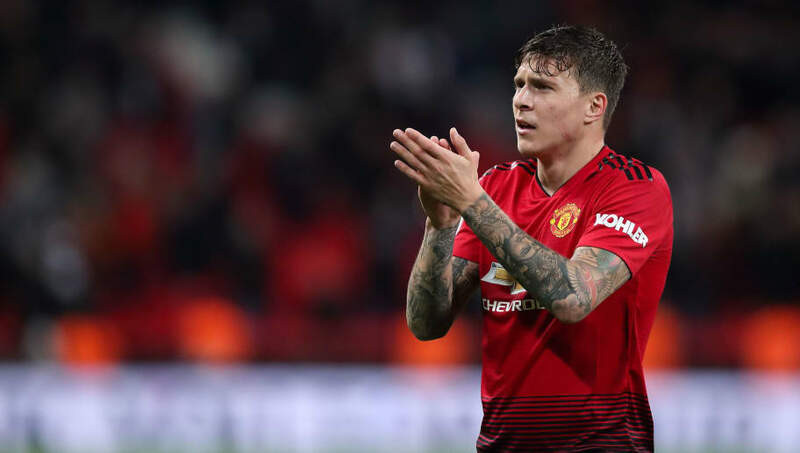 Another nightmare of a game for both Lindelof and Manchester United, and this time, it would not have been unfair to believe that Lindelof´s time at Old Trafford was done and dusted. "I actually feel a bit sorry for him [Lindelof], he should not be playing at this level", were Jamie Carragher´s exact words. Fast forwarding a few months, he has won Sweden´s most prestigious individual award, ”Guldbollen”, as Sweden´s Player of the Year, and in the same month, he won Manchester United's player of the month award for November, as voted by the fans. After the departure of José Mourinho and the appointment of Ole Gunnar Solskjaer, Lindelof has once again raised his defensive game through several impressive performances throughout December and January, leading him to be shortlisted for Premier League player of the month for January, further cementing himself as first choice centre half at Manchester United. Lindelof undoubtedly had the worst possible start to his career as a Manchester United player. Nearly a year on, he is considered undroppable in the heart of defence and is at this moment in time Manchester United's best centre half - and a huge source of confidence for fans as they prepare to face Paris Saint-Germain in the Champions League on Tuesday night. He has been knocked to the ground countless times, many times because of his own errors and mistakes, but he has always got back up as a stronger player, but maybe more importantly, a stronger man. To be criticised in the way he has, countless times, and still be able to in the end prove everyone wrong, requires a special kind of player. Most of all it shows that he is indeed a Manchester United player, and there is nothing indicating that he is done writing his own fairytale story at The Theatre of Dreams.